It's a popular notion about the black community: they don't like outsiders coming in and messing with their business. Walk down any street in Harlem and shout out the "N-word" and you'll find that out real quick. It's just not a good idea. This is more or less the secondary theme behind MTV Films' latest release, "Save the Last Dance," which opened January 12 in the United States. 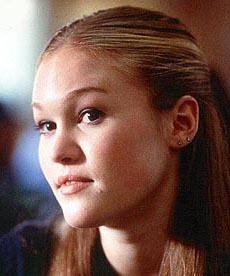 In "Last Dance," Julia Stiles ("10 Things I Hate About You") - a former MVP - plays Sarah Johnson, a high school student who enjoys dancing ballet. A tragic accident forces her to move from the Midwest to live with her father in inner city Chicago, where she has to enroll in a mostly black high school. She quickly makes friends with Chenille (Kerry Washington, of no fame whatsoever) and her brother Derek (Sean Patrick Thomas, "Cruel Intentions"). Sarah goes with her new friends to a predominantly black club on a Friday night, where it becomes painfully obvious that she has no idea how to dance "black" (which might be a good thing, since she's white). Derek then takes Sarah under his wing and begins teaching her how to dance to hip-hop music, but realizes that she has some natural talent from somewhere else. He pries, finds out about her past with ballet, and encourages her to go after her dream of going to Juliard. This would be an extremely dull and very simple story line if not for the not-so-hidden "white person in a black world" sub-plot. The script, written by Duane Adler, tries to accurately depict the conflict between the two different worlds, and succeeds at some parts, but fails at others. For instance, when Sarah and Derek begin a romantic relationship, the predictable prejudices rear their ugly heads in many different forms, ranging from Derek's best friend to his jealous ex-girlfriend. However, the idea of a midwestern white girl going to school in the ghetto, and immediately finding four or five close friends in just a couple of days is ludicrous. nothing more than to get out of the ghetto, and the next he's a rough, crude gangster with a criminal record that trouble always seems to find. This is, of course, entirely possible, but it just doesn't work in this situation. However, even with all of the plot holes and the rather uninspiring acting in "Last Dance," there is still something strangely likeable. You leave the movie theater knowing there were a lot of things that just aren't realistic, but you still think it was a good movie. Maybe you just like ballet. Maybe you're a sucker for the racial issues-based movies. Maybe you have no idea why you liked it. But you do. "Save The Last Dance" continues a very specific stereotype of what the black teenage community is like, and there is no doubt that a number of black activists will speak up against the movie's depictions of African-Americans. However, though the open-mindedness of the black community may be in question, one thing is certain: if a white person walked into a Harlem club and started dancing as poorly as Julia Stiles was in the first hip-hop scene, they might not be shot . . . but they definitely would be kicked off the dance floor.